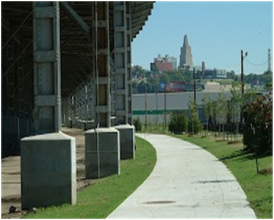 The Riverfront Heritage Trail is a fully accessible fifteen-mile bicycle and pedestrian pathway that begins at the riverfront and winds through the oldest and most historic parts of bi-state Kansas City. It is the first of its kind in Downtown Kansas City. It links communities, parks, and exciting destinations with unique new venues and dramatic public artworks. Most importantly, this trail serves as a hub for all the surrounding mid-town and suburban trail systems that are attempting to link up in the process of creating a metropolitan, by-state trail system. Historic markers along the Trail help to make the trail a journey through the early history of this region. As such, the Trail will enhance bi-state Kansas City’s historic, cultural and recreational treasures. The Trail will help our community gain access to our spectacular rivers, improve the community’s quality of life, enhance transportation, and improve the environment while simultaneously stimulating economic development. The Riverfront Heritage Trail basic construction which began in 1998 was completed in 2016. A 15 mile trail was obviously never intended to be an area-wide trail system. Rather, it was designed to be the hub of such a system. In the process of completing this trail major urban and topological challenges had to be conquered such as crossing two rivers, scaling major bluffs, and negotiating multiple highways, railroads, and levees. The ultimate purpose was to help make all future trail construction less expensive and more efficient. Arguably, this award winning Trail is the very heart of the entire metropolitan trail system. 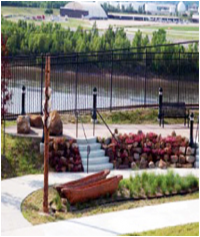 The Riverfront Heritage Trail is testimony to the fact the by-state projects can be successful. Indeed, it is a product of a coalition of public and private stakeholders including the City of Kansas City, Missouri; Unified Government of Wyandotte County and Kansas City, Kansas; Port KC, Missouri; and Kansas City River Trails, Inc. These partners continue to be committed to developing a high quality trail and along the way improving and beautifying the adjacent urban landscape. Along the route of the Trail considerable effort has been expended to improve infrastructure, replace barren land, and clean up or remove blight. The Trail with its interpretive elements improves the value of any adjacent property and is an agent for attracting tourists and new businesses. 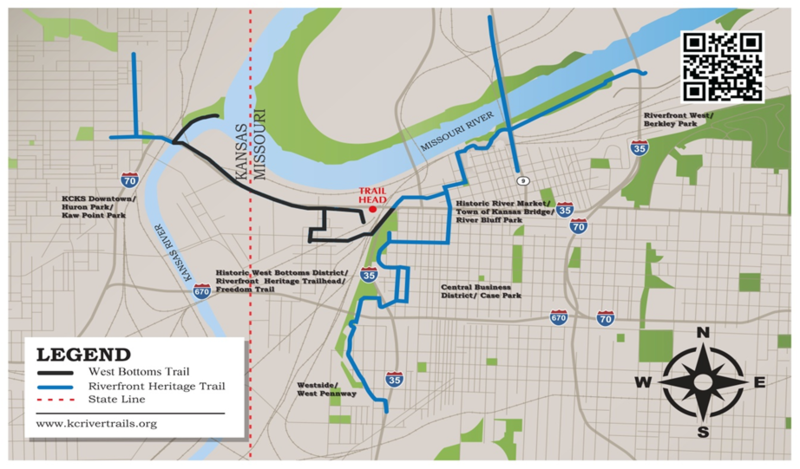 Thus, in the final analysis, the Trail is a serious commitment to visibly and permanently transforming the bi-state landscape and the livability of the communities near the Trail. 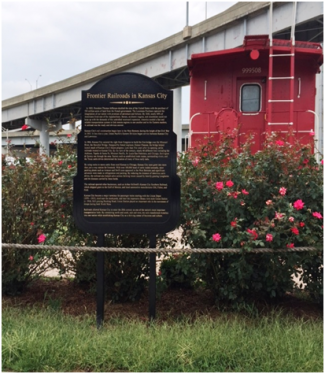 Therefore, the Riverfront Heritage Trail is a catalyst for redevelopment of downtown Kansas City, Missouri, the Central Industrial District and downtown Kansas City, Kansas. Proceeding east to west along the trail the Historic West Bottoms segment begins at 4th and Beardsley at a small pocket park named River Bluff Park. Here there is a great view. Proceeding west along the trail bikers and pedestrians can safely cross the BNSF and UP rails over the Forrester Viaduct on their way to the west bottoms or Kansas. At 8th & Belleview the trail leads to the Riverfront Heritage Trail Head. Here travelers on the trail will find two very special malls: “Freedom Mall” dedicated to the freedom from slavery and “Spirit Mall” dedicated to the early efforts to build a rail crossing over the Missouri River and the start of a the Frontier Railway. Pictures are enclosed later in this report. Leaving the park on the Trail one will travel along the Freedom Trail which was used by slaves escaping to the Free State of Kansas. Proceeding on the trail one eventually comes to the Woodswether Bridge over the Kaw. Now a pedestrian bridge it was once a roadway to the West Bottoms. Here a collection of art by area artists has been mounted on the bridgework with descriptive signage calling attention to the areas past topological, Indian and slavery heritage. Leaving the bridge a new pathway carries users to the beautiful and historically significant Kaw Point Park and its tribute to Lewis & Clark. 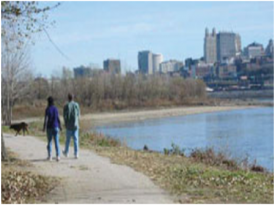 Working to create the trail and connect various trail sections has been an ongoing challenge for Kansas City River Trails, Inc. since the late 1990s. The trail crosses numerous jurisdictions, including DOT property from two states, U.S. Army Corps of Engineers-controlled areas, levees controlled by a number of different levee districts, and streets and viaducts controlled by a bewildering variety of different agencies. 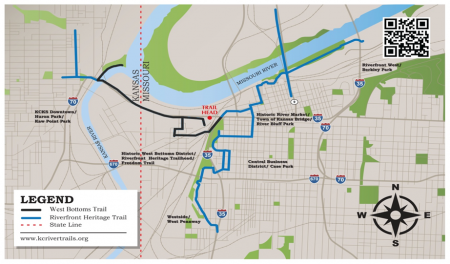 Against all of those difficulties, and working cooperatively with a large number of different government bodies and agencies as well as public and private funders, the Riverfront Heritage Trail has been painstakingly put together section by section, bit by bit, to finally create a nearly seamless connection. 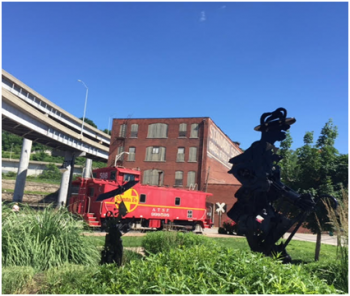 Kudos to the Kansas City River Trails, Inc. and its leadership, and to the many cooperating agencies, organizations, and businesses, who have worked together to make Kansas City's Riverfront Heritage Trail a reality. 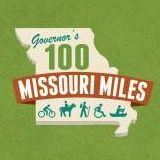 Working to encourage, develop, and celebrate a world-class bicycle, pedestrian, and trails transportation system across Missouri is one of four primary goals in MoBikeFed's Vision for Bicycling and Walking in Missouri. Trails like the Riverfront Heritage Trail are a key part of that system. Our goal is to link trails like these into an ever-growing, seamless network across the state and across state lines.